Oh, yes, it’s that time of the year again. The temptation is to put the camera away as the days shorten, and the light seems to worsen. But remember the wise words of the great Ernst Haas (which I never tire of trotting out): “All light is GOOD light” (my emphasis). You know what he means. It’s as good as you make it. 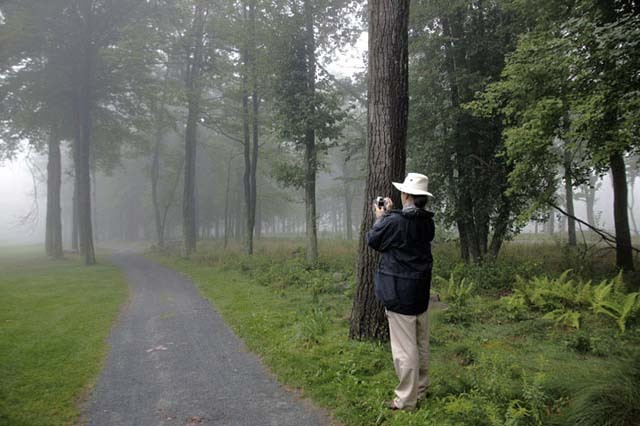 Let’s see what happened when I was on a shoot for a book and the day was drenched in rain, then autumnal fog and cold to the bones in pretty Pocono, Pennsylvania. 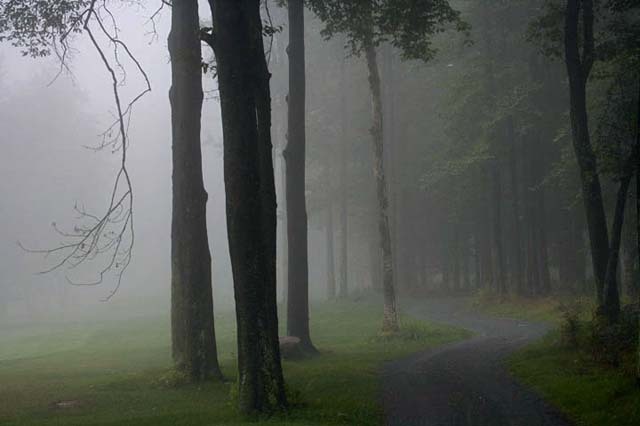 Because the fog accentuates aerial perspective, small distances between objects are pictorially exaggerated. With this kind of unusual natural effect at your fingertips, the only issue is to find a subject matter that exploits that illusion. Although it’s tempting to stay indoors with a hot cup of cocoa on such a miserable day, pull your coat on and get out there! It’s very easy to find beautifully atmospheric results. A gently meandering path next to a golf course looks promising. 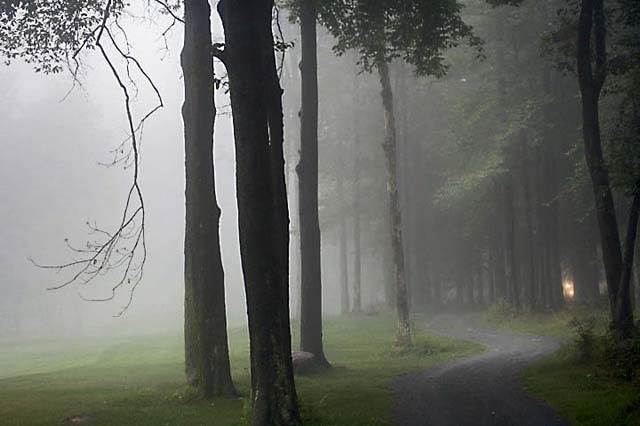 In the fog, however, it disappears before going far. The question was how to bring some life and mood into it. Another positive feature of foggy weather is that it drains colour away from everything, presenting you with a ready-made pastel palette to work with. The lack of vibrant colours in the landscape means you can experiment with delightful subtleties of tone and contrast. 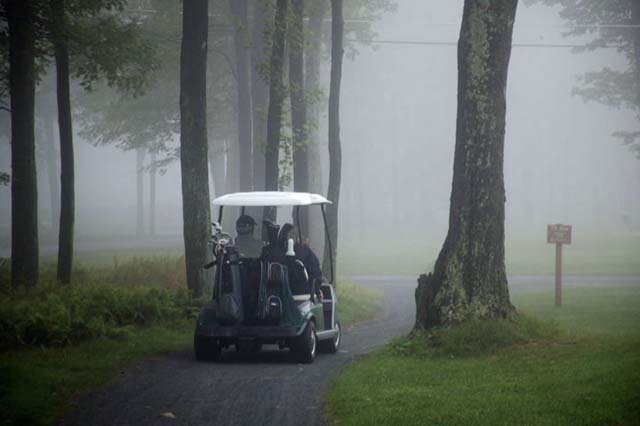 Try having a focus – like the golf cart – moving through the scene so it is not too still. 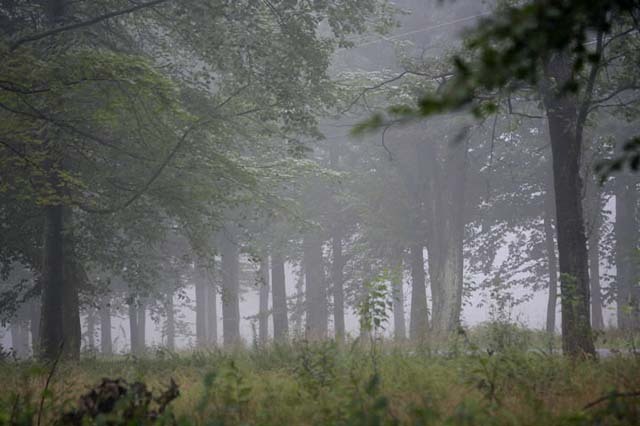 The misty landscape of trees, while pretty, lacks a focus or point of interest. 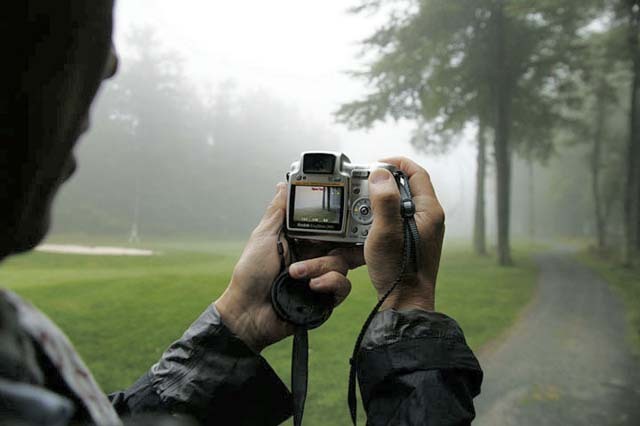 Achieving the correct exposure in foggy conditions is critical – you have only a narrow range of brightness to work with, so an error can throw the entire image. Bracketing the shots – that is, taking a series of correct, over-, and underexposed shots will ensure you have plenty of images to choose from. The path in the shot encourages the eye to move through the image, giving the viewer the feeling that they are exploring the image. The differences in the darkness of the trees gives the image an exaggerated aerial perspective, enhancing the sense of space. But there’s something lacking. I always like to include some hints of human presence in my pictures. I had noticed cars passing with their lights on. I waited for them, trying to release the shutter just before the moment the lights appeared between the trees – the gaps between them made timing rather tricky. As well as giving a sense of scale to the image, the lights point to the thickness of the fog and adds a sense of the pea-soup, cold mood of the day. OK! That’s a wrap! Now, where’s that cup of chocolate? Set landscape mode (if your camera has this: it makes apertures smaller to maximize depth of field), and may boost colours, sharpness and contrast. Set a medium sensitivity (higher if the light’s really low).